My first Doctor Who episode was a X’mas special, and it was when they introduced David Tennant as the 10th Doctor in 2005’s The Christmas Invasion. I misjudged the episode thinking that what a wimp of a character this Doctor is, just lying there, shivering, and what did they call it, “he’s regenerating” and could not do anything to help the poor Rose Tyler. You guessed it, I didnt finish the episode and told myself, nah, I can never get into Doctor Who. Fast forward another Doctor Who X’mas special in 2006’s Voyage of the Damned and I really dont know why as the episode was not that great either but I fell for Tennant’s charms and eventually embraced Doctor Who which will become a permanent fixture of my geekness. That’s it, when I thought I never wanted to be in the TARDIS, he locked me in and never gave me a copy of the key. That was how my love affair started with the Doctor and boy, how it has flourished. Of the 4 Doctor Who X’mas specials I have seen & enjoyed, I must say that this is the best of them all in terms of it’s very close association with the festive season, and not just because of the title. It may however disappoint viewers who would rather see a loud, bang on action episode, probably looking for scary villains or monsters and not find them here but I feel that Doctor Who also shines and is sometimes even much better if it’s just there to tell a story, a story that even a heart of stone will touch. Remember Richard Curtis’ moving “Vincent and the Doctor” last season? 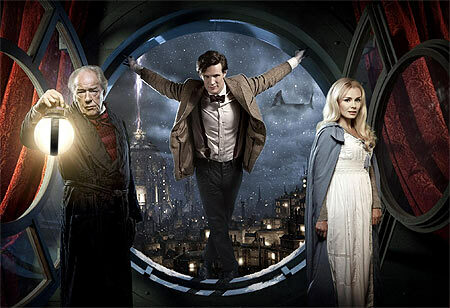 A Christmas Carol worked for me on many levels and was quite impressed as to how that genius Steven Moffat has done it again by infusing time travel with another heartfelt story and interwoven with the classic Dickens tale. And did I just see River Song? Oh joy.